The Yalda ceremoney will be held on 15th of December at aeFEUP. “Yalda Night” is a traditional Iranian celebration of the longest night of the year in the Northern Hemisphere, which has been remained popular since ancient times. This celebration is honored on or around December 20 or 21 of each year. A brief description about Yalda and the related traditions is followed. 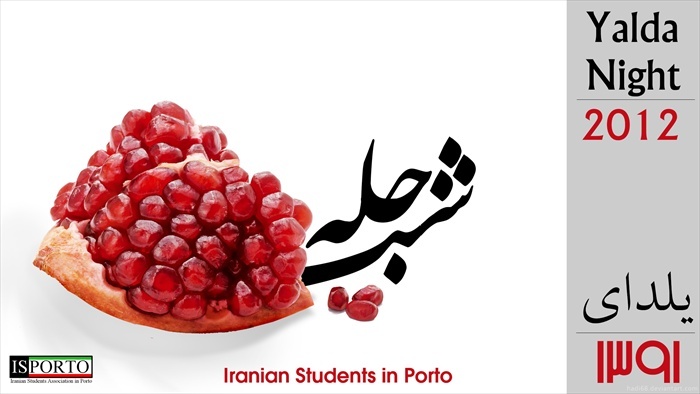 This year, we are planning to organize this event to celebrate the “Yalda Night” at AEFEUP building, University of Porto. This will be a great opportunity for us to present this tradition to Portuguese students as well as other interested nationals. • Presenting Yalda Tradition with brochures, and Photo snapshot. We’ve prepared a flyer as a call for interested participant which is provided in the following. As a cultural event, which is aimed at presenting the Iranian culture and considering the agenda of this event, we made an estimation of our expenses. There is no need to emphasize that your support will enhance the quality of this cultural event and we appreciate your cooperation and support. In the following, we have provided a short description to Yalda, the traditions Yalda is a celebration of Winter Solstice fallen on the 21st or 22nd of December. Yalda is a Syriac word meaning birth and refers to the birthday or rebirth of the Sun. Yalda is regarded as the longest night of the year. Every year, Iranians celebrate the transition of fall into winter, occurred at the Winter Solstice, like other Persian celebrations coincide with the change of seasons. Yalda night, the last night of the Persian month of 'Azar', has remained popular for centuries and been marked as the victory of light over darkness and the renewal of the Sun. Yalda indicates the concept of Light and Good against Darkness and Evil in Zoroastrianism religion, the ancient Persian religion. In Persian poetry Yalda signifies many things such as the separation between loved ones, loneliness and waiting. Many believe waiting would be over after this night as the light would shine and goodness would prevail. After this night, Light prevails over Darkness as the days grow longer and give more light. Yalda has a root in Zoroastrian belief, Mithraism religion. The Mithraists believe that Mithra, the Persian god of light and truth, was born to a virgin mother in the morning of the longest night of the year, Yalda. It was said that Mithra was born out of the light that came from within the Alborz Mountains, symbolizing the Sun god overcoming darkness power. Ancient Iranians known as 'Yar-e Ghar', cave mates, gathered in caves throughout the night to witness this miracle together at dawn. Nowadays Yalda has become a social occasion when friends and family gather to eat, drink, tell stories and read poetry, especially Hafiz, until dawn. On the eve of Yalda bonfires are lit outside and family and friends gather around a Korsi, a low square table covered by a blanket overhanging o all sides with a heater placed under the table. People are usually gathered in the house of the eldest in the family to enjoy the moments of being together. Mixture of nuts, snacks and fruit such as grapes, honeydew melons, watermelons, pomegranates, pears, oranges, tangerines, apples, walnuts, almonds, peanuts, raisins, pistachios and hazelnuts are served. On this night, the oldest member of the family says prayers, thanking God for previous year's blessings, and prays for prosperity in the coming year. Then he cuts the melon and the watermelon and gives everyone a share. The cutting symbolizes the removal of sickness and pain from the family. Snacks are passed around throughout the night, pomegranates with angelica powder and a combination of nuts and dried fruits, particularly pumpkin and watermelon seeds and raisins. The fruits signify the hope for having a fruitful spring and summer. The red-colored fruits symbolize the crimson hues of dawn and glow of life, invoking the glory of Mithra. Pomegranates with angelica powder are believed to protect individuals against the Devil. The mixture of nuts literally means night-grazing. Eating nuts is said to lead to prosperity in days to come. Watermelons and yogurt are eaten as a remedy for the heat of the summer, since these fruits are considered cold, ‘sardi’ and Halva is eaten to overcome the cold temperatures of winter, since it is considered hot, ‘garmi’. On into the night of festivities the family keeps the fires burning and the lights glowing to help the sun in its battle against darkness. They recite poetry, play music and tell jokes and stories until dawn.